Cut down on dirty looks and verbal rebuttals with this pre-printed It’s Not Smoke It’s Vapor T-Shirt Comeback, Of course some may want to argue and debate with you anyway. But it will help in many circumstances. 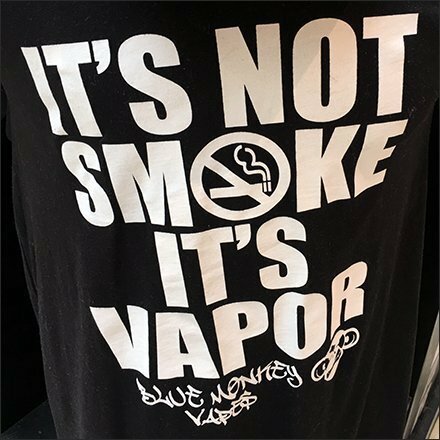 This It’s Not Smoke It’s Vapor T-Shirt Comeback to no smoking regulations a natural, and seen at a Blue Monkey Vape Bar Mall Kiosk.